After seeing Lady Bird, Mike Brown (a man) weighs in on the best female coming-of-age movies. I recently saw Lady Bird, which was smart, funny, well acted and directed perfectly. Lady Bird is a small movie, but it’s also a powerful coming-of-age story. And it got me thinking about other coming-of-age movies that I loved when I was younger. I haven’t had the opportunity to re-visit most of these movies, but I remember vividly the same feeling of transportation back to those important first steps on the road to being an adult, the exciting stuff, not learning how how a check “floats” or paying your first late fee on a credit card. After reading a couple of these kinds lists online, I tried to avoid super obvious movies, like the Molly Ringwald 1980’s oeuvre, which I heartily endorse, or really any other movies from the last thirty years. 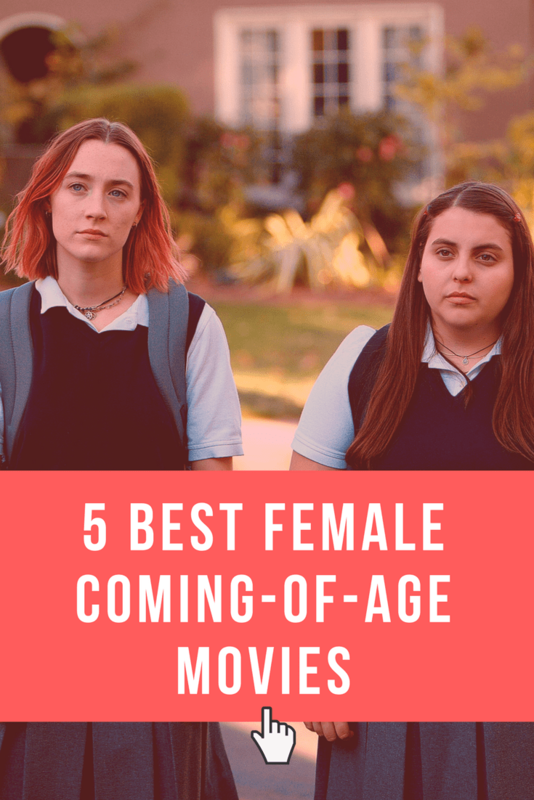 Here are the best female coming-of-age movies that hit home when I watched them. For me, this is the ultimate in female coming-of-age movies. Emily Lloyd shines as a young woman in the ‘50s who is drawn to adventure and looking for life to be interesting. Wish You Were Here is much darker than Ladybird, but it has a lot of the same story beats, disappointing boyfriend, moody guy seeming interesting, an actual break with the family. Emily Lloyd never became a household name, but her work here is nothing short of brilliant. Double Feature: Interestingly, Wish You Were Here is loosely based on the same memoir that another obscure ‘80s British gem comes from, Personal Services, about a British madam. Queue them up as a double feature! Most vivid memory: Her overage suitor smoking in near darkness in an alley, like something out of a horror movie. Summer camp can sometimes illuminate some deeper truths. Sure, the emotional level of Dirty Dancing can only be described as histrionic, but this movie has touched a lot of people over the years. My wife, the lovely Kelly, and I have been planning a trip to the hotel where this was filmed for years, although the Dirty Dancing weekend is always sold out by the time we get around to booking. Easily, my favorite part of this movie is Jerry Orbach as Baby’s dad. No one contrasts better with teenage drama than the stone-faced Orbach. But Jennifer Grey and Patrick Swayze have fun chemistry and make some ridiculous moments— true-to-life adolescent ones— really work. Watch for Jennifer Grey to say something stupid, “I carried a watermelon,” and then immediately wish for a do-over. Double Feature: The Outsiders, for more period Swayze. Most vivid memory: Gotta go for Swayze sliding on his knees across the floor. There’s a TV version of this one coming! Heathers is a fun movie that frequently almost falls apart and then kind of does fall apart. But the central character, Veronica, played by Winona Ryder, keeps the movie on track. Veronica hides behind an ocean of snark and, even though she is involved in several murders, she ultimately learns some pretty valuable lessons about how to judge other people. Heathers is an attempt to deconstruct the whole coming-of-age genre, but somehow manages to seem sweet, even while swimming in a sea of absolutely filthy profanity. Double Feature: Five Easy Pieces, about a grown-up jerk, but you get to see the real Jack Nicholson delivering some of his best lines after watching the excellent Christian Slater doing his teenager Nicholson shtick in Heathers. Most vivid memory: Veronica burning herself with a car cigarette lighter. I couldn’t quite bring myself to re-watch Little Darlings, which is probably terrible. But I saw it when I was a teenager and it really affected me emotionally. The message for me was something like, “Hey, girls are going through all these weird feelings too!” But I think the message to a lot of 12-year-old girls was something like, “You are not alone.” So if you are actually a kid, this might be a great movie to watch. Double Feature: Might be a fun movie marathon with My Bodyguard, a forgotten classic. Or maybe Meatballs for the camp setting? Most vivid memory: A crush on Kristy McNichol? I don’t really remember much about this movie, except that it was great at the time. Okay, this one straight-up isn’t that good either, but for some reason, I love it. Phoebe Cates plays Carson, who is engaged, and her friends take her out for a party weekend. This has a few of the same odd beats as Dirty Dancing, weird Southern stuff like a dramatic reading of some Gone with the Wind lines. But again, if you liked Lady Bird, which we’ll liken to “champagne,” then Shag is “spoiled apple cider.” Still fun! Double Feature: Fast Times at Ridgement High, for more Phoebe Cates. Most vivid memory: Some hilarious fetishizing of beer. Beer is great! They were right! Thanks for reading! Which coming-of-age is your favorite? Tell me in the comments!